The filter unit M 802 is a mobile filter unit that can be used for many applications requiring the filtration of fumes, dust and gases. 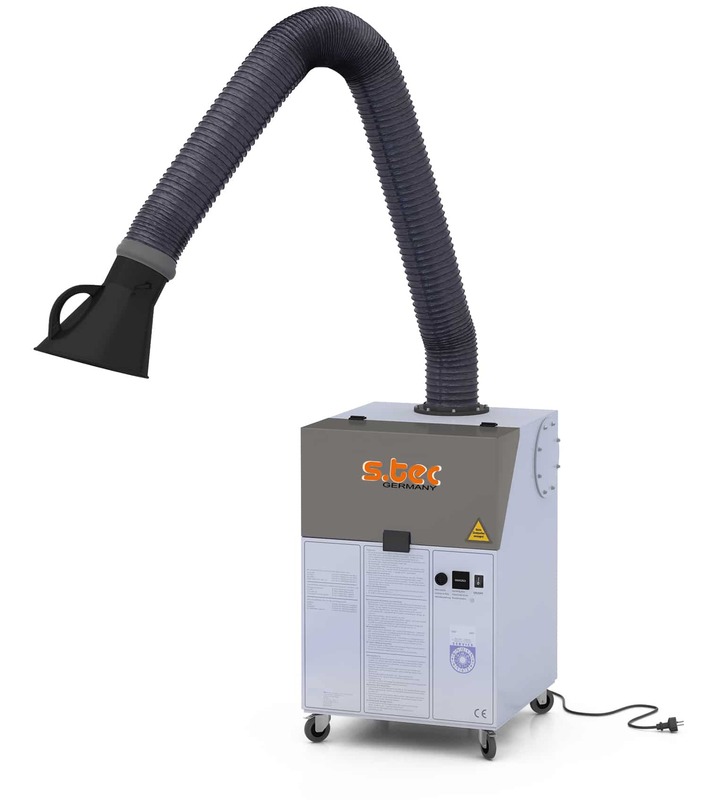 The unit is IFA certified for welding fume category “W3” (certification IFA: 1005029); separation efficiency > 99,9 %. At approved use the M802 filter unit is suitable for the separation of fumes, which are released during welding works of carbon steel including high alloyed chrome-/nickel steel. GS – mark symbolizing tested safety. It indicates that the filter unit complies with Germany equipment and product safety Act (GPSG) and the relevant directives. The polluted air is extracted and led into the filter unit either by the self-locking extraction arm or by other capturing elements. The particles or gases are extracted from the airflow during a filtering procedure consisting of several stages and the cleaned air returns to the working area. For welding-working bays, in workshops, for soldering applications, for restorers and in locksmith’s shops. You receive a complete „Plug and Play System“ that is ready for operation. It is only necessary to connect the intake elements before commissioning the unit. The advantages of the compact unit are the robust and solid construction. The housing is made of a stable steel sheet construction and coated with powder from the in- and outside. The filter elements are accessible via a maintenance flap. Therefore, they can be easily and rapidly withdrawn. The unit is equipped with suitable control elements.